The Cairo report shares the experiences of Egypt’s largely overlooked sub-Saharan African refugee integration, as well as their impact on the several neighborhoods in the city. With next to no meaningful opportunities for local integration, minimal assistance from the international community, and no path to citizenship, future prospects for refugees in Cairo are dim. Yet, despite enduring high levels of racist and xenophobic harassment, abuse, and violence, Cairo’s refugees make the most out of a difficult situation and persevere to develop and sustain their communities. 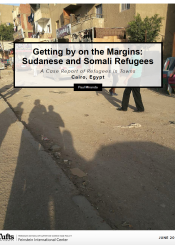 The report draws on the author’s years of experience as a case worker for refugees in Cairo, and benefits from the viewpoints of two research assistants who are themselves sub-Saharan African refugees living in Cairo.